Modern data centers offer web scale technologies which optimize and automate compute, storage and networking infrastructure. Yet, critical application service components like the application load balancer have been slow to modernize. Enterprises have had little choice but to use inflexible hardware ADCs (application delivery controllers) like F5 BIG-IP or Citrix NetScaler load balancers. These outdated appliances are not architected for cloud-native applications with demanding traffic management patterns. To compensate, they are often overprovisioned causing businesses to overspend to gain the necessary performance and availability. F5 BIG-IP and Citrix NetScaler fall short of modern application services capabilities beyond load balancing, such as application analytics, hybrid-cloud requirements, predictive auto scaling, app maps for microservices applications, programmable self-service and micro-segmentation. Delivers central control with a distributed pool of service engines across multi-cloud deployments and consistent application load balancing for monolithic and microservices applications. Infrastructure-agnostic architecture, natively supports hybrid and multi-cloud environments providing a consistent admin user experience for load balancing workloads. 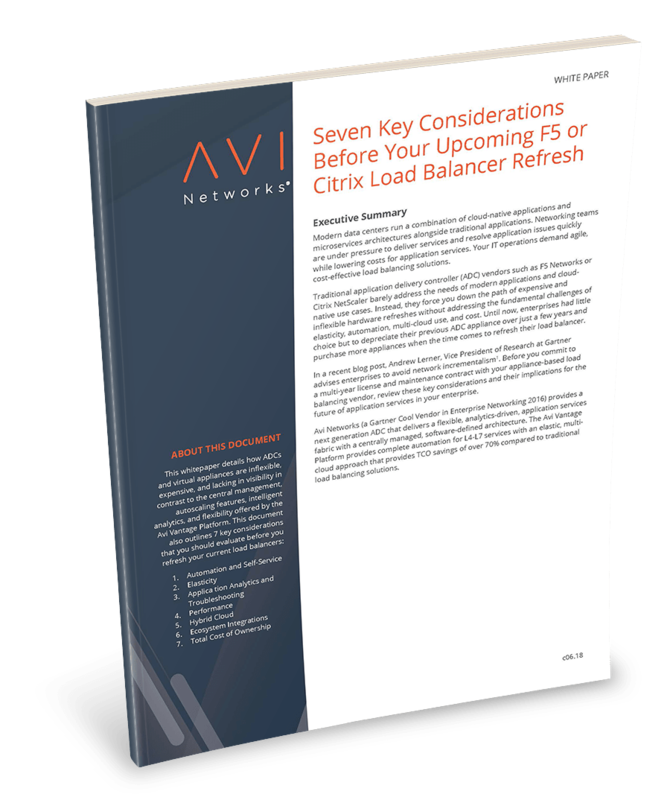 Unlike Citrix NetScaler or F5 BIG-IP, Avi Vantage enables automatic scale up or down in response to traffic without painful manual intervention. Additionally, operations teams can deploy apps faster by automating common tasks using Avi’s 100% REST API. Get real-time, actionable application analytics which allow admins and app owners to efficiently troubleshoot network and app issues in minutes. Doing this with an F5 or NetScaler Load Balancer is near impossible. Outperform legacy F5 and Citrix NetScaler hardware with faster provisioning and by eliminating expensive, frequent hardware refreshes and time consuming manual management.